A neighborhood is like the spokes of a wheel, in that we are all interconnected, particularly when it comes to economics and commerce. I say that because as a small business owner of a local bicycle shop I see our interconnection every day. First, as the consumer and user of the Internet I am besieged hourly by slick advertisements about products I have expressed interest in by my Internet browsing habits. The onslaught also shows my desired item at significantly discounted price. And, on the other hand, I see these web-based products when I am asked frequently about to fix these products after my neighbor/customer who has gotten “a great deal” from Amazon or a big box store, but without adequate instruction or now that the product is not working. I generally try to help my neighbor/customer, but I also remind them of how economically interconnected we are. That is, if they buy locally they not only help our economy, but they will have someone who will make sure their purchase works or is properly repaired. Every time a small, locally owned business closes there are fewer jobs, more people on unemployment and less tax revenue for our community. For example, if my bike shop closes because everyone chose to save a few dollars and buy their equipment on Amazon, now besides not having an expert mechanic to fix your bike, that bike mechanic is without a job and maybe on welfare. The closure of a local business has a negative rippling effect through our local economy. The unemployed certainly will not be partaking of the local restaurants, but more seriously, they may well lose their home, their car or other items of value without their local paycheck. And in some cases, the former might out of necessity become welfare recipient. Small businesses have created over 8 million jobs since 1990. One of those jobs be yours and if not, not having local people employed will affect the local economic environment and potentially your job. Over 50% of the working population begin (120 million) is employed by small businesses and since 1995, those small businesses have generated 66% of all new jobs in the United States. Small businesses are a big deal! What do you think will happen to our community if the small businesses are fewer in number? When you support a local business, you're supporting your town, city, and neighborhood. Businesses pay sales taxes to your town, city and county where the small business is located. Wander off to a big box business elsewhere or on the Internet and that money isn’t benefiting your community. Plus, tax money is used to support your public schools, parks, roads, bike lanes, trails and sidewalks, as well as, funding public services such as police and fire. Is Amazon, eBay or any of the other online retailers paying those taxes into your community? The great aspect about buying local is it your supporting people who live in your community, your friends and neighbors. Who knows if the local small business may someday end up being your own customer or if not, the money you spend locally will find a way to benefit your local community? Small business operators are experts. You are their friends and neighbors, and locally owned businesses have a vested interest in knowing how to serve you. They are passionate about what they do. Why not take advantage of these expert local services? Small business owners strive to survive and one of their biggest advantages they have over large retailers is the ability to provide more personable, hands-on and memorable customer experiences. If you go into a local bike shop and they don’t meet your needs, you have a choice, go to another local store. Does the Internet, or big box stores give you that choice? Another aspect of shopping locally is an implicit guarantee of quality both for the work in the product. In today’s global economy it’s entirely possible that some product you believed was made in a certain location or was certain quality control has in fact been produced on a gray market where there is no known location or quality control. When this product fails if you have bought it from the Internet or a big box store your ability to return it for a refund is de minimis. If you purchased it from a local merchant, they are part of the community and have an obligation to correct the inadequacy of the product they sold. You have someone who can personally right the wrong. In my business, a bike shop, we are not ripping you off! It might not seem like you need to support your local bike shop, because generally you’ll be able to get absolutely everything you need cheaper when you go online. But due to the gray market and some manufactures unwillingness to control their products, a lot of times you will be able to buy for example Shimano parts online for cheaper than Shimano sells the same parts to a local bike shop. What happens when those online retailers run all local bike shops out of business and suddenly, they hold a monopoly on what you need? No service, and you are stuck. Algorithms don’t right wrongs. A website can’t thread brake cables through a frame. Unless you live next door to the Shimano factory in Japan or the Cathedral Della Campagnolo in Italy, your local bike shop will be the first port of call when you want someone who can properly re-true your wheels or accurately tune your gear? Buying and knowing your local bike shop, or local merchant will make your life easier and economically more productive. Think about it. Who is more likely to help you, your neighbor or Amazon or a big box store? Your choice to this question should determine who you buy from next. A neighbor or an anonymous, antagonistic, algorithm? Act locally, think globally. 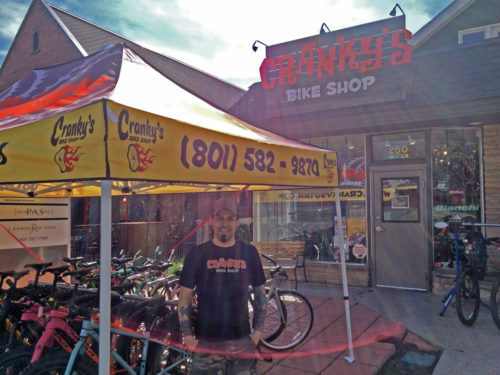 Cristiano Pereira is the owner of Cranky's Bike Shop in Salt Lake City.